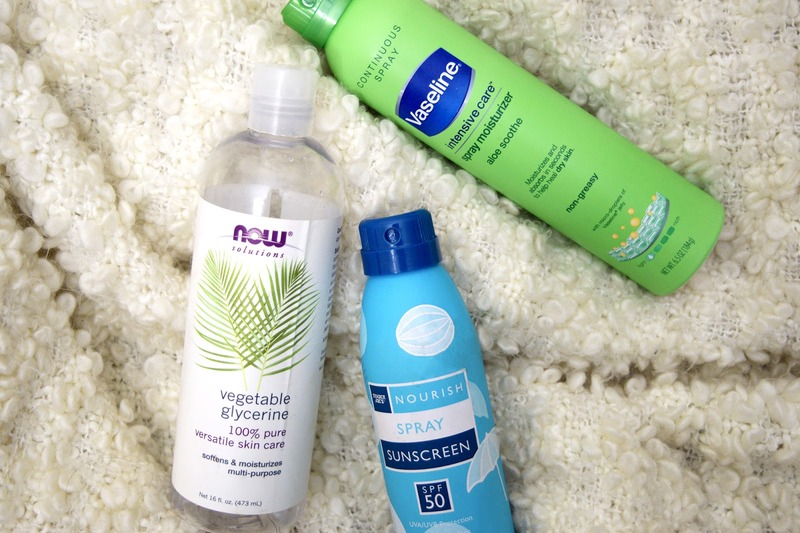 Today I wanted to share with you my summer skincare picks! I use these three products daily to make sure my skin stays hydrated and moisturized. First, I pour about a tablespoon of vegetable glycerin into my palms and massage the product into my skin for about one minute until it's evenly distributed. I then take my Vaseline spray moisturizer and spray it on top of the vegetable glycerin and massage it in once more. This time, the Vaseline and vegetable glycerin mix into each other and set into my skin. Finally, to add some sun protection, I spray on my Trader Joe's sunscreen and do the last skin massage. It's best to do this right when you get out of the shower and your skin is still a bit damp. The product takes very well and your skin soaks it right up. This helps prevent dry skin in summertime as well as protecting you from sunburn! What do you use to keep your skin moisturized and protected from the sun during the summer? *This product was gifted to me to review by Influenster.